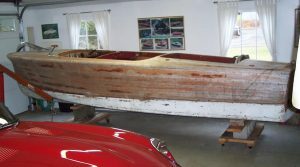 In 2012 Denis and Patricia Donohue brought this 1948 Chris Craft Deluxe Runabout 17′ home. 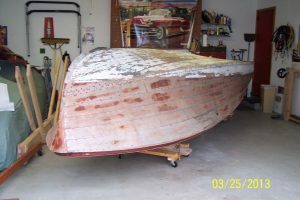 This Project boat will be my first woodie restoration. It appears to be very original and I was told it has been in storage since 1955. I bought it without an engine but otherwise the hardware is pretty complete including the aluminum carb shroud for the KBL engine. I am currently searching for a complete KBL engine to restore. 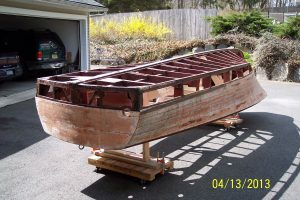 I will be installing a 5200 bottom and will replace all of the topsides and deck planking as well as any frames necessary. 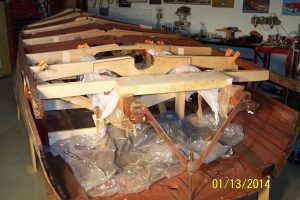 I have the CC build sheet which shows it left the factory on 1/30/1948 with a destination of Lake Sunapee NH. UPDATE: A lot has been accomplished since my last entry. I flipped the boat and removed the bottom. 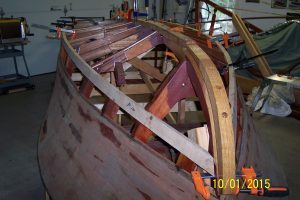 I fabricated and installed the following new parts out of white oak – stem, gripe, keel, chines, the complete transom framework and the 4 rearmost bottom frames with strut block. 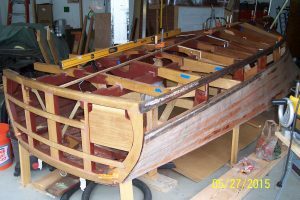 The rest of the bottom frames were replaced using mahogany as well as 4 of the topside frames. 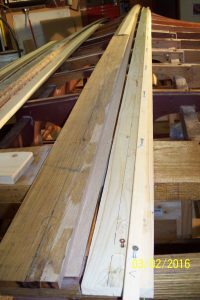 At this point in time the intermediate frames have been steam bent and I am just about ready to start installing the bottom plywood and planking using 5200 per the Danenberg method. 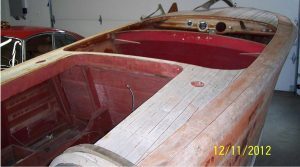 I have also managed to procure a complete running KBL engine so the boat will be restored to its original configuration. The picture diary is so valuable for us to see. Is there also a chronological list being accumulated of (1) hours, (2) new tools, and (3) materials used? 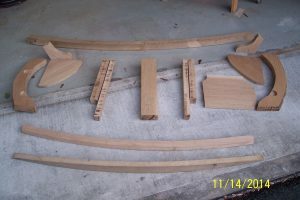 Thank you, Denis, for sharing the progress on this project. Keep us posted with the rest of the story. 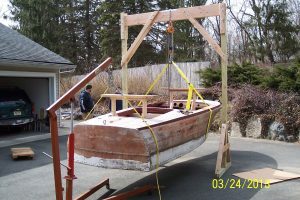 Pictures and reports from your events or individual boats and projects are always welcome and enjoyed on this website. Please email information to kathyparker@acbs.org or submit directly to this website.